2 hours 19 minutes and 44 seconds after starting, I finally crossed the finish line. Tired, sore, yet completed elated, I caught my breath and stretched out my aching legs. I’d just completed my first half-marathon and I was chuffed to bits. Although it was 4 minutes and 44 seconds over the time I was hoping for, I was still pleased with the result. After watching our fellow runners cross over the line, Ian and I hobbled off on aching limbs back towards the car. As we collected our t-shirts and bags of goodies along the way, I’d already made dibs on the first shower before we’d even got home. I’ve been running on and off for over 2 decades but until this year, I’ve never really taken it seriously. I would go to the gym and do 3-4 runs a week while daydreaming about the marathon I wanted to run – but never make any attempt to actually train for it. 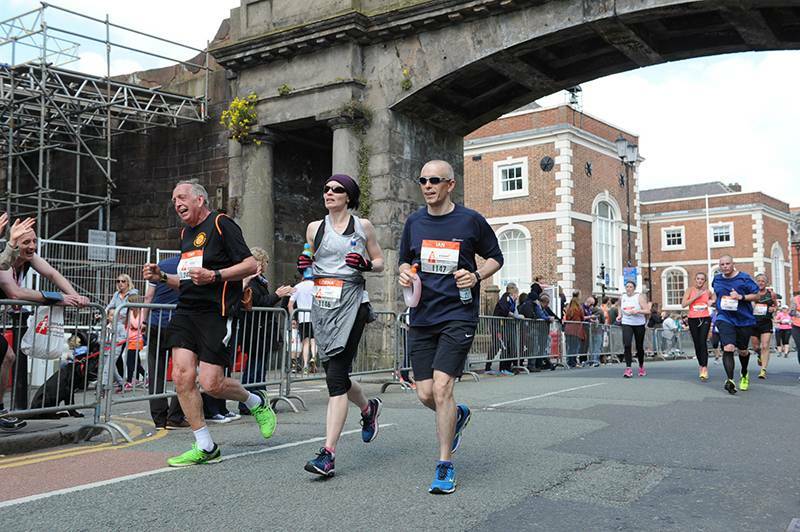 So earlier in the year, when a bunch of Ian’s workmates asked us to join them in the Chester half-marathon, I decided to put the wheels in motion and answer with a big fat ‘hell yeah’! Even though I work out 6 days a week and I’m no stranger to running, it still doesn’t come easy to me. I give myself little pep talks to keep going because it’s so damn hard, I feel the need to swear repeatedly, and when I’m road running I also give little whoops (seriously). But even though I find it tough, I love it. It’s the one exercise that constantly challenges me and leaves me feeling great afterwards. My head is clear, I can think logically and I feel like I can take on the world. I’m a solo gym goer. I go there purely to work out. I put my earphones in and turn my music up. I get in and I get out – I’m not there to chit chat and make friends. So my weekday treadmill runs that were made up of speed sessions and tempo runs, I was very happy to jump on the treadmill and get on with it. But the longer runs at a weekend? Oh, man – I was glad to have Ian by my side as I pounded the pavement. Come rain or shine, 6 miles or 10 miles, we did them together. If I’d have been doing the outdoor runs alone, I’m sure I would have given up on a few of them. It was good to have a buddy there to push me when I had nothing left, and I know Ian felt the same. It was tag team training at its best. When you’re running on empty and you feel like you’ve got nothing left in your tank, you’ll be grateful for someone to give you words of encouragement. You’ll find training plans vary greatly depending on your running level, so make sure you allow yourself the appropriate amount of time you need to train. Before committing to the race, I wanted to be sure that my joints could take the strain, so I decided to increase my running on my own terms before signing up. Unfortunately, this meant we didn’t complete the full 12 weeks of the training plan we were following. Then when I picked up an injury, I quickly saw my training schedule reduce from 10 weeks to just over 8. This meant we missed the long run of 12 miles, and the furthest distance we covered in training was 10. More seasoned runners told us it didn’t matter and that we didn’t need it, but on the actual day when I hit 10 miles and realised there was still another 3 to go, it was the hardest 3 miles ever. I regretted missing that 12-mile run and in future, I’ll be doing my best to make it part of my training plan. Overall, our diet is pretty good. During the week we eat quite healthily and normally save treats for the weekend. Having said that, the worst thing we probably eat is an Indian takeaway on a Saturday night and a homemade cake on a Sunday. Even with our takeaway, though, we ask for it to be made with no ghee and minimal oil, making it as low in fat and calories as possible. 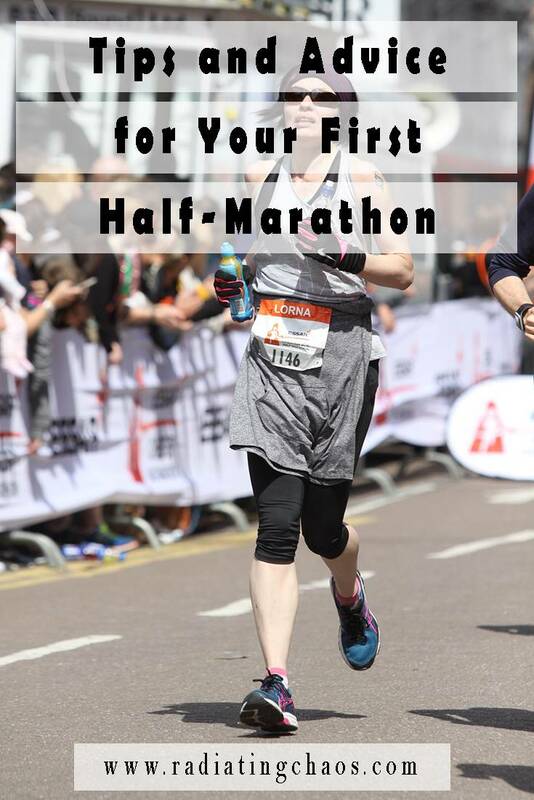 But when we started training for our half-marathon and I found myself throwing up at the side of the road half-way through a run, I soon realised my Indian takeaway wasn’t any good. I’m not a nutritionist in any way, shape or form, but it’s quite self-explanatory that what you put into your body, affects the way you feel – so it’s important to provide your body with the right foods to help you get the most out of your workouts. The night before a run, and also on the day of a run, our evening meals pretty much consisted of pasta with plenty of vegetables and some tofu. Just like with your evening meal, make sure you provide your body with the fuel it needs to work efficiently. I’m a firm believer that breakfast is the most important meal of the day and I never skip it. On the morning of a run, or any workout for that matter I always eat at least an hour before. Muesli mixed with a bit of granola and a cup of green tea is what gets me going. I realise there’s a grey area about eating before exercise, but personally, I’m pro-eating. I like to fuel my body and give myself the energy I know I need to keep going. Eating after your run is just as important. You need to replace the energy in your body that you used up during your workout. If you’re looking for something quick and easy, try a crunchy peanut butter Clif bar, or these easy to make, no-bake protein bars. These three components aren’t just specific to running, they’re crucial elements of any workout, yet I’m still surprised at how many people leave them out of their training. As an ex-aerobics instructor, it’s a huge bugbear of mine to see people neglect these areas of their workout. If you’re following a training plan, it should include recommended guidelines for you to follow. Never be tempted to skip your warm up, it’s there to prepare your body for the work ahead. Launching cold muscles into a full workout without warming them up first is an injury waiting to happen. My running sessions always include 5 minutes of walking followed by a 5-minute jog, then into whatever my training session involves. Not only does it slowly increase your heart rate and get the blood pumping through the muscles making them more efficient at contracting, it also helps reduce the risk of injury. Psychologically, it can also help you mentally prepare for the workout ahead of you. After each training session, slow down to a jog for about 5 minutes followed by a 5-minute walk. This will help cool you down and bring your heart rate back down to normal. When we started covering longer distances, the yoga pose downward dog, soon became one of my favourite stretches. The harder the run, the more time I would spend stretching out afterwards. It’s safe to say, I would listen to what my body was telling me. I personally love the stretch after my runs. I suffer with pain in my joints so I always spend between 10-20 minutes stretching, although 8-10 minutes should be sufficient. Apart from helping to bring your muscles back to their natural resting length, stretching out can also help prevent injury and blood pooling in the legs, which can happen when you suddenly stop after vigorous exercise. Instead of the blood being pushed back to your heart to re-oxygenate, waste products end up left in the muscles which can cause swelling and pain. If you get injured, rest! Around week 5, I injured my right hip flexor during one of our weekend runs and even though I felt it go, I kept on running. I probably ran for 3-4 miles even though I knew I should have stopped. Having struggled with pain and injury in my left hip-flexor for over a decade, I should have known the signs, but I guess I didn’t want to admit it. When I got home I stretched out, took some ibuprofen, then put some ice on it. For the next week, all I did was gentle yoga and stretching, with lots of ibuprofen, ice and periods of rest. About 10 days later I was back to training, but I could have done without the setback. It’s not only the setback in your training but by running through an injury, you risk doing even more damage, which means a longer recovery time. Over the years I’ve become pretty good at listening to my body, unfortunately, this time around, I was a little bit in denial telling myself it would be okay. Chances are if I’d have walked when I first felt the pain, I’d have only been out for a few days. When we started doing our outdoor runs we found ourselves taking a short break at the half-way point. To begin with, stopping for a drink, walking it out and generally taking a few minutes to catch our breath seemed like a good idea, but we soon noticed we were struggling to pick up the pace on the way back. When we realised the knock-on effect it was having on our overall time, we made the conscious decision to just keep running. And surprisingly, it wasn’t that difficult. If we were running a loop we just kept going, and if we were running to a point and then back again, we made a u-turn at our current pace. This made such a difference to our training, and it made me realise a lot of things really do come down to mind over matter. When you start doing longer runs, think about sticking some energy gels in your pocket. When running, your body mainly relies on carbohydrates as energy, but unfortunately, we can only store a certain amount within our muscles. This means on longer runs your body can’t store enough glycogen to fuel the whole run, but energy gels can help replenish this. Take your first gel approximately an hour into your run leaving at least an hour before you crack open another one. This is a pretty simplified version of how to use energy gels, for a more in-depth explanation check out this article. I personally find them a bit grim. I take them because I know they can help, but I dread it when it’s time to knock one back. The nicest ones I’ve found are these High5 Isogels. No matter how much training you do and how mentally prepared you think you are, I don’t think anything can fully prepare you for your first race. Seasoned runners told us to make sure that we didn’t start out too fast and this is good advice. But while this information is true, and you’ll do well to keep it in mind, we found pacing ourselves at the starting line really difficult. Even if you’re in the correct group for your estimated finish time, you’ll find that everyone is running at different speeds and it can be quite difficult to gauge just how fast you’re going. And if you start out too fast to begin with, you’ll end up paying for it later. I found the start of the race quite difficult. Not used to being surrounded by so many people, I soon found myself getting carried along with the other runners and I couldn’t control my speed. 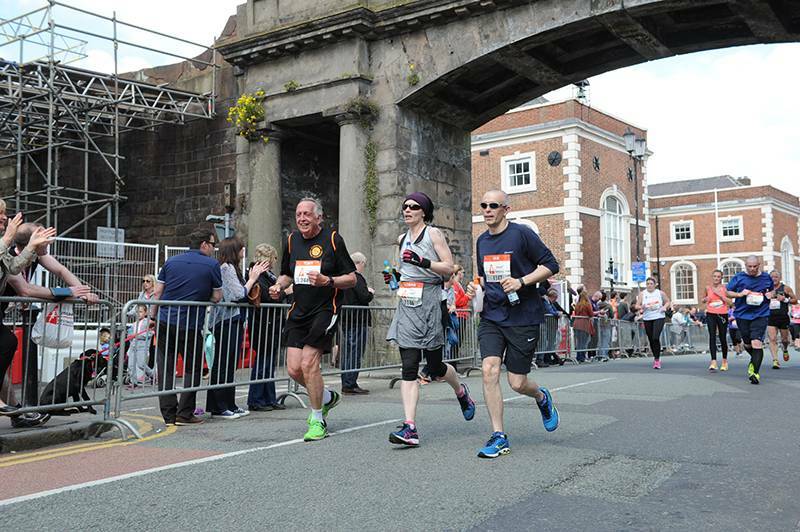 Certainly, in the Chester half-marathon where during the first mile or so there are some narrow stretches, I felt really penned in and it was only after the roads started to widen and the crowds began to spread out that I managed to find my pace. But by then it was too late; being swept along in a sea of people at the beginning meant that by mile 6, I was finding it really difficult. A lot of people complete the race by walking, and that’s great, everyone has different abilities. But if your intention is to complete the race by running the whole 13.1 miles, you need to maintain momentum. If you get tired, slow down to a jog. At one point when I was really struggling, Ian asked if I wanted to walk and I said no. I knew if I started to walk I wouldn’t be able to pick up the pace again. Even though I ended up doing a few 11-minute miles, for me, it made more sense to stay consistent and run slower. If I’d have walked, even for just a minute, it would have been game over. One lady who was part of our crew said the worst thing she did was slow down to a walk. What started out as a bit of a breather, turned into a walk-run cycle for the rest of the race because she couldn’t find the energy or momentum for anything else. My best advice for the day (apart from have fun), would be to make sure you get into the right starting group and watch your speed in the first mile. If you’ve trained to complete the race in 2 hours 15 minutes, get into that group – don’t convince yourself you’ll complete it in 2 hours or less. You’ll either end up slowing the people down who should be in that group or you’ll be deeply disappointed when you don’t complete it in that time frame. The 2-hour mark is probably the most popular, but you’ll find whichever group you’re in, there’ll be people there who shouldn’t be. Unfortunately, they just slow it down for the rest of the group. Have self-discipline. It’s easy to start out too fast when you’re in a large group, especially if it’s your first race. If you run with a sports watch, keep an eye on your current pace, and if you’re going faster than your race pace because of the crowds, pull it back, you’ll be glad you did later. We were in the 2 hours and 15 minutes section because that’s what we’d been training for. If we’d have managed to pace ourselves at the start instead of getting carried along with the crowd, I think we would have made it. Throughout the course, they’ll be several stations where volunteers will be handing out refreshments. All I can say is, take whatever is on offer. Early in the race it will be bottled water, but as the course progresses they’ll be energy gels and sports drinks available too. Towards the end, I was grateful for anything I could get my hands on! Even though I knew there would be stations en route, I still had a bottle of cordial with me, just to make sure we had plenty of fluids along the way. Above all – have fun! Along the way, there are bands singing their heart out and crowds of people cheering for you, and trust me, they’ll give you a boost when you need it most. 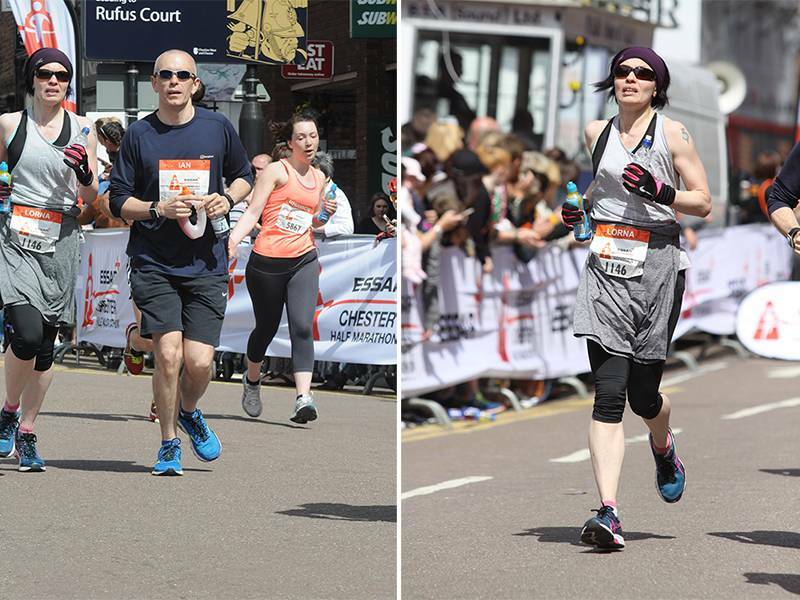 When you’re running along and someone shouts your name – it’ll help carry you over the finish line. When I hit the 11th mile, I didn’t think I was going to make it. But with whoops and cheers from the crowds at the side of the road, I managed to push myself over the finish line – and it was the best feeling ever! Good luck with your training, and don’t forget to cool down and stretch out once you’re done. *Once upon a time I worked as an aerobics instructor, gym instructor and personal trainer. Currently, I’m not working as a ‘fitness professional’ – this information is based on my own experience and fitness level. If you have any health concerns please seek professional advice before starting any fitness program.